Do you know how many bridges cross the Seine in Paris? So you won’t think I’m cheating, I’m counting pedestrian bridges (3 of them – bonus points if you know where they are) and railway bridges (2 – more bonus points if you’ve been on them). Have a little think. Count them up, and I’ll tell you later. 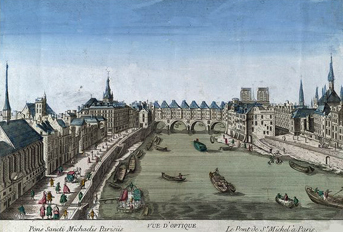 The Pont Saint-Michel links the Place Saint-Michel on the Left Bank of Seine to the Île de la Cité. First constructed in 1378, it has been rebuilt several times, most recently in 1857. Now here’s the part that gets me. 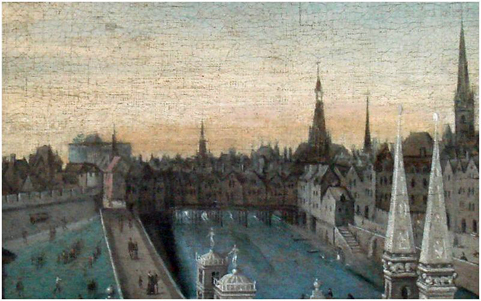 As was common in the Middle Ages, the bridge's sides were quickly filled with houses. Do I need to tell you what happened next? Apparently wood wasn’t such a good idea. Still, it was the Middle Ages and they were doing their best. (Montréal still has the problem of bridges falling down)! Auberge Nicolas Flamel is said to be the oldest stone house in Paris (1407). Bet Nicolas was happy he didn’t build on the Pont Saint-Michel (he chose 51 rue de Montmorency in the Marais – it’s now a restaurant so you can visit if you like although I'm pretty sure they've modernized). If I could go back in time, this is what I’d want to see - the houses on the bridges and little winding streets that stayed in place until Haussmann revamped the city. Maybe I've read too much Victor Hugo. So, did you have a little think about the bridges? If you were way off, don’t feel bad. I had no idea. I was thinking more in the 10 or 12 range. Now I’m embarrassed.